So in Fridays edition of the Albuquerque Journal there was a news story titled "N.M. May Go to Paper Ballots". So my first thoughts were what the hell! So, I started to read the article and was laughing through a good portion of it. The story is bellow if you wish to read it. So as I have figured out from the story, basically we would all use Scantrons to vote. To the right is an image of a Scantron form that I found on the internet. This is also very close to the form we use in College and I used in High School. The only difference is that the version we use has 50 questions on it, and not 12. Now, I have major problems with Scantrons, as they have failed me in the past. 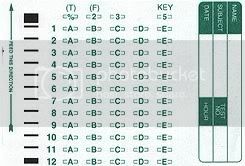 On tests it has marked many of my answers as wrong, when in fact they were right. It will pick up any marks on the paper and can be very inaccurate. So, I wonder how this is going to improve our accuracy when it screws up students and we use these dumb things all the freaking time. Also, lets not all forget Florida where they used paper ballets, and totally screwed the whole thing up. Is this really a step forward as Gov. Richardson says it will be? Or is it really just a step backward for the most backward state in the union? I think it’s more backward then forward. Granted, I agree with Richardson that we need to standardize the state election systems, so no matter where you are in the state you are using the same thing, but paper ballets? WTF is that. Is he getting some kick back from logging people, so that they can cut down more trees? Also, look at the cost. $11 million freaking dollars is a lot to spend on a system for paper ballets. I know in the November 2004 election here in Albuquerque several people were critical of the electronic touchscreen machines, saying they switched votes several times. But you know what; I and many other people used the electronic touchscreen machines and had no issues. I do think there needs to be some more testing of the touchscreen machines just to make sure all the bugs are out, but I think they are just as good as any other system. I think the real problem here is the public. The touchscreen systems are new, and not many people are used to using them, and hell, even some are probably scared crap-less of them. As for the issue of there being no paper trail for the touchscreen systems, just add your normal run of the mill store receipt printer like the kind used in grocery stores (or even laser printer for that matter), and you have a paper trail of the dumb thing. I think people are making this much harder then it really needs to be, and I really do not think that we need Paper Ballots. What really gets to me is "attorneys for several New Mexico voters who sued the state last year to block use of electronic touchscreen machines said a conversion to a statewide paper-ballot voting system could end the need for the litigation." That is the biggest bull-crap I have heard in a long time, and it figures that an attorney would say it. So as I said in my subject for this post, My Governor Wants To Send Us Back To The Stone Age. SANTA FE— New Mexicans could return to voting by paper ballot as early as the November general election if the Legislature approves a new plan from Gov. Bill Richardson. Voters would mark their choices and then feed the ballots into optical-scan tabulators to record the results. Converting to a paper-ballot system statewide could require the purchase of about 1,500 optical-scan tabulators at a cost to the state of about $11 million, officials said. Eleven of New Mexico's 33 counties already use a similar system. "I am proposing a bold step forward by standardizing the election systems in all of New Mexico's 33 counties," Richardson said at the Capitol on Thursday. "Accuracy is more important than speed," the governor said. He was referring to national controversy over vote counts by electronic touchscreen and lever machines without so-called "paper trails," as well as the expected slower pace of voting by paper ballot. Richardson, along with Attorney General Patricia Madrid and voter activists, touted a standardized paper-ballot system as a way to recapture public trust in elections. The confusion and delays of the 2000 presidential election were among the problems cited. Paper ballots were used before the advent of mechanical and electronic machines and are still used for absentee voting. Critics of electronic touchscreen machines, used in several New Mexico counties, including Bernalillo County, contend they are inaccurate and prone to erroneously switching vote tabulations. The new machine purchases could be phased in over two years, although most would be in place for 2006, Richardson spokesman Gilbert Gallegos said. Machines with special devices would be available to help handicapped and non-English speaking voters mark their ballots. "This is tremendously good news," said Paul Stokes, a voter activist from Corrales who attended Richardson's news conference. New Mexico's move toward paper-ballot voting systems reflects a growing trend, said Dan Seligson of Electionline.org, an organization that tracks voting issues nationally. But Bernalillo County Clerk Mary Herrera said the state could have a hard time making the transition. Voting precincts might require more room to accommodate extra booths needed to allow voters to mark their ballots in secret, she said. She noted that Bernalillo County bought 300 electronic touchscreen machines for $2.3 million three years ago. Converting to a standardized voting system in a short period might prove difficult, Herrera said. "Let's see how the public feels voting on paper ballot," she said, noting that paper ballots could slow down voting in New Mexico, which already is known for slow and extended counts. "That's the real question," Herrera said. But Ernest Marquez of the state Bureau of Elections said returning to paper ballots would not necessarily mean longer lines or slower counts. "There should not be any lines because you can set up as many (voting) booths as you want," he said. "The voting machines could count 400 ballots a minute. It's not a perfect scenario. But like the governor said, he wants them accurate, not fast." Attorneys for several New Mexico voters who sued the state last year to block use of electronic touchscreen machines said a conversion to a statewide paper-ballot voting system could end the need for the litigation. A plaintiff in the case, Joyce Bartley of Albuquerque, said Thursday that she welcomed the chance to use paper ballots to vote. Bartley said electronic touchscreen machines switched her votes several times during the November 2004 election. "After my voting experience, I would favor a paper ballot," she said. Current Mood: amused, but not really. Thank you for the comment... I am feeling better now about this guy but I am still a little down... he seemed sooooooo perfect!!! He was sweet funny and soooooo hot!!! WHY ME?!?!?!?! If I had a quarter for every time Scrantron has gotten my grade wrong...well, I'd have about $2, but still. I think I would have a little more money then that, but ya. But still, like I said, if we use it all the time, how would people react who only use it once a year or less! So that is my rant for know. BTW, do you have AIM, I need to chat with you about some junk that I really do not want to do on aim yet. If you check my "user info", you will see my @livejournal.com e-mail address, if you want to just drop me a note that way, that works for me. * rant for now. I cant type or spell tonight. LOL.